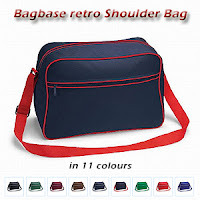 A great quality retro shoulder bag ideal for work, college or school. I wanted a shoulder bag big enough to supplement my small rucksack for a week away from home and small enough to use for work. A bit bigger than a large messenger style bag, but with a much larger capacity this is the perfect size. I wasn't entirely sure about the retro-style when I ordered it, but it's a little bigger than I imagined (no bad thing) and the matt canvas look works well so that it doesn't shout 'look at me!' At least I hope not. Of much more importance to me is its functionality. I went away for Xmas for a week and had my clothes in my small rucksack. In my new shoulder bag, I managed to comfortably fit a small netbook, Kindle, flask and large cup, various cables and chargers, proper headphones (not earphones), compact camera, a notepad, some small gifts, a large toiletries bag, cuddly toy. OK, I confess, the cuddly toy had to stay at home. The main compartment of the bag has a tall and firm divider so that you can keep a laptop and/or a folder full of papers in it. The other side seems to kind of expand the more you put in it, so even if you only carry a few things around with you, it doesn't look over-sized. There's also a much smaller inside zip compartment useful for storing keys, wallet or something of that size. The outer zip pocket is useful for keeping your mobile device, camera, notepad, travel tickets and other smaller items that you might want to access quickly and easily. Although I haven't used it for this purpose yet, it would be great to use for something like going swimming, too. For the price, style (and choice of colours), size and functionality I think you'd be hard-pressed to find anything better.